Most homeowners take it upon themselves to clean their own windows. But let’s be honest: it’s a major hassle. Between maneuvering yourself toward hard-to-reach spaces, and the elbow grease involved in scrubbing off the outside surface, it’s no easy task. Who wants to waste their weekend lugging around a ladder, pail, and squeegee? Plus, you could actually hurt yourself if you’re not careful. Are sparkling, crystal-clean windows really worth a broken leg? Professional window cleaning services aren’t just for businesses and public buildings. Homeowners can also hire someone to take care of the dirty job of window cleaning, leaving you free to enjoy your time off without breaking a sweat. It may seem extraneous, but professional residential window cleaning can actually be worthwhile every so often. Here are some of the great benefits you’ll enjoy when you hire a cleaning company to do your windows for you. You’ll be amazed at the visual difference that squeaky-clean windows can make. Windows are exposed to all kinds of dust, pollen, dirt, and other pollutants, and over time, they build up a hazy layer. Thorough professional cleaning with high-grade solutions gets rid of the grime, letting the sunlight stream through and upping your curb appeal. Your neighbors will notice the difference. Help your windows last longer. Windows can easily wear down over time. If you’ve ever replaced one, you know what a hassle it can be. Getting your windows cleaned occasionally helps increase the longevity of the windows you already have. It removes things like oxidation, acid rain, and hard water, which can easily damage the glass. Tired of looking at the fingerprints and dirty streaks on your living room picture window? You put so much effort into your beautiful home decor, and you work so hard to keep your house clean. Why let dirty windows take away from that? With clean, crystal clear windows, you can take in scenic views and enjoy the warm afternoon sunlight. 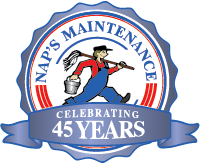 At NAPS Maintenance, we provide window cleaning services for homes as well as businesses. Call us any time to schedule professional window cleaning, and start enjoying your view of the outdoors: 508-226-4492.